Stuart Borthwick’s book, The Writing on the Wall: A Visual History of Northern Ireland’s Troubles, was given its Belfast launch during Féile an Phobail last week. 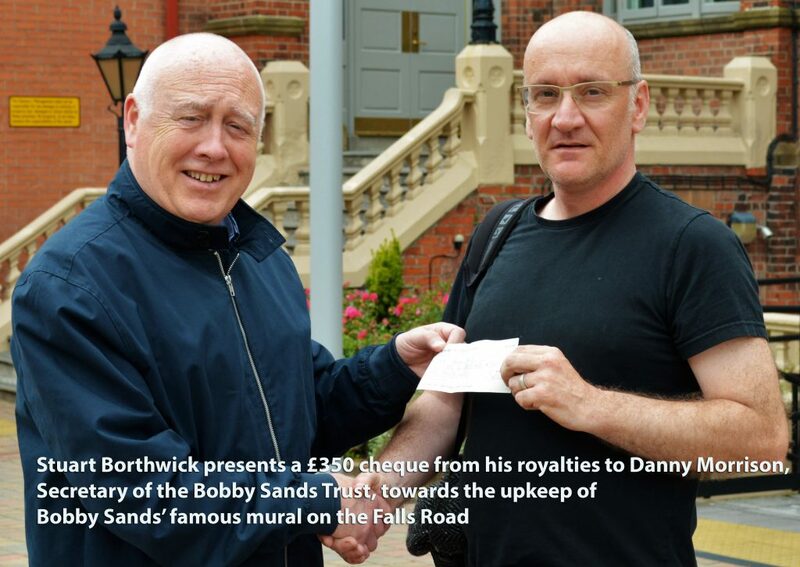 Danny Devenny, an ex-political prisoner who served time in Cage 11 with Bobby Sands, is a former graphic designer of An Phoblacht/Republican News and is one of Belfast’s best-known muralists. In this very personal review he talks not just about the book and murals but also Bobby Sands and The Beatles! I first met Stuart when I and young Mark Ervine (son of the late David Ervine, leader of the PUP) were invited to ‘Ireland’s second capital’ in 2008. A group of Liverpudlians, led by big Peter Morrison, had visited Belfast the previous year to attend a Damien Dempsey concert at the Odyssey Arena. 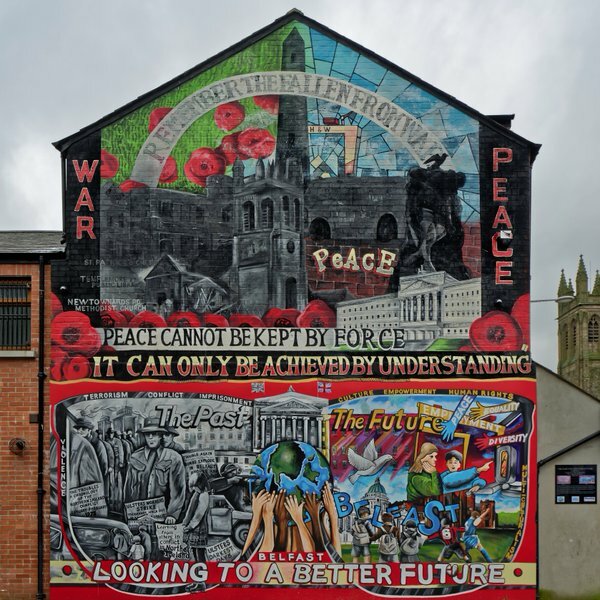 While in Belfast they did a tour of the murals and were so affected by their power and vividness that they decided to offer us an invitation to cross the Irish Sea and create a series of Beatles’ murals as part of Liverpool’s selection as European Capital of Culture. When a Belfast newspaper reported on the proposed project I was criticised for declaring my delight to be afforded the opportunity at last to paint my real hero, John Lennon! 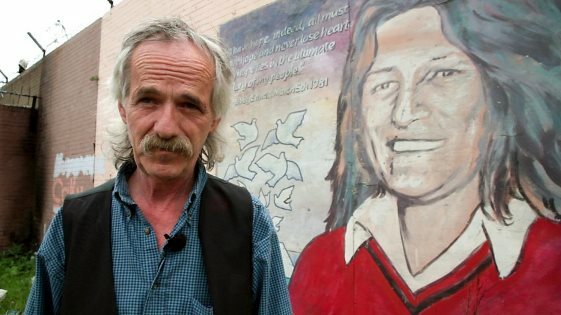 My critics’ logic was because I had painted another great hero, Bobby Sands on the famous Falls Road mural, I was undermining his memory by naming the famous mop top Lennon as my hero! If only my accusers knew! Bobby was a big Beatles fan, particularly of Lennon. So, let’s rewind to 1975, Cage 11, after we were back in huts after ‘the Fire’ of October 1974, when we burnt down Long Kesh. Among the LPs sent in was a replacement copy of Wings’ Band on the Run. Next door to mine and Dee’s ‘cell’ was that of Tomboy (Loudon), Roon (Gerard Rooney) and Bobby’s. And it was there, guitar in hand, that Bobby proceeded to play in a loop the entire album, determined as he was to learn every track off by heart! Which brings me to another Liverpool mural visit connection! (I will get to your book in a moment, Stuart!) Thanks to Stuart we were invited by Peter Morrison and Phil Hayes, and others, back to the lovely city to launch another mural to celebrate the city’s Irish connections. And it was there that I was introduced to Mike McGear, Paul McCartney’s younger brother who played with Scaffold (and got to Number 1 in the pop charts with Lily the Pink in 1968). Mike used the stage name McGear so that he could not be accused of trying to piggyback on the name of his famous brother. Now a practicing photographer he was very interested in the visual impact of murals and mural culture here in Ireland. Our conversation developed into the subject of Irish Liverpool solidarity down the years and he seemed real chuffed to highlight his father’s pride in his Irish roots. Inevitably, our conversation moved on to the Troubles and to the prison conflict. Mike was genuinely interested and truly amused when I told him how Bobby in his perfectionism had eventually taught himself the chords of the entire album, Band on the Run, and had treated us to a six-hour rendition of Mamunia (normal duration 4mins 50 secs – I just Googled it! ), till he got it right. That was Bobby – a perfectionist. Mike was intrigued by this story. He said it was his favourite track too, and said he wanted to learn more about Bobby and the hunger strike. Interestingly, for all you McCartney fans – what was the name of one of the best-loved nighttime stories among the blanket men that Bobby would tell, out through the narrow crack in his H-Block cell door, and which features in the film 66 Days? You got it – Jet! from Band on the Run. I must also mention the night in Cage 11 Bobby sang Rod Stewart’s Mandolin Wind, accompanied by Big Rab and Tomboy on mandolin. Everyone who was there remembers the magic of that moment – when none of us knew of the nightmare ahead. Well, this book educates, and more. The layout is superb. I say that as a one-time ‘cut-and-paste’ graphic artist for An Phoblacht/Republican News back in the day, and as someone familiar with the skills of blending written word and imagery to create a single narrative. I’m momentarily back in Cage 11 again as I recall the first time I got interested in this. We had received a lot of Palestinian books and pamphlets from some friendly supporters on the outside (possibly Danny Morrison and Tom Hartley). I was struck by their layout, so easy to consume, the visuals and written information slipping into the subliminal mind with the ease of Eine Kline Nacht serenading the senses. So unobtrusive. The perfect education tool. And that, to his credit, is what Stuart has achieved here. His ability to fuse mural imagery – whether on the walls or, in this case, on the pages of his book – with his narrative, and subsequently trace the history of this British ‘Troubled’ but beautiful wee island from competing perspectives. Stuart’s masterly and perfectionist approach to his photography not only dumbfounded me but shocked many of his other Belfast friends with his totally insane excursions! He would alarm his hosts, rising pre-dawn, to go out to get the perfect camera angle or lighting effect! What he sought, I think you’ll agree, was worth those inhospitable expeditions. The photographs stand alone as beautiful works of art regardless of the murals within. Some of his work is so stunning that I felt a little pride in my own work… and to achieve that in another artist is remarkable. And so, a final word. Looking back through Stuart’s book you realise none of this was accidental. Every word, every photograph is premeditated, planned to perfection. That is the talent of the little man from Hastings. Keep on rockin’, Stuart! Your day has come! Tá do lá tagtha!